Refurbished 3 bedroom home boasting an open plan entertainers delight. Functional kitchen flowing through to large dining area with internal stairs down to another living area. Perfect for families alike where you can virtually enjoy two living areas at once. Both dining and living room have extensive deck space allowing for Alfresco dining throughout the day into the night. 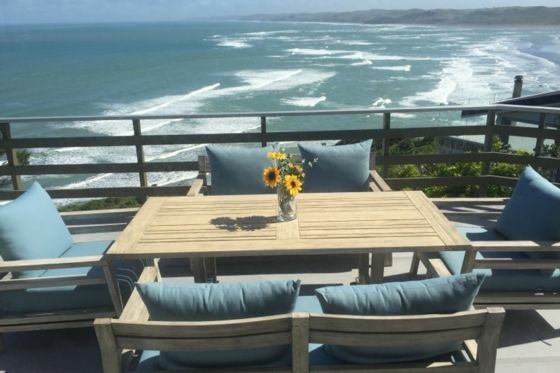 Spectacular views of Tasman Sea, Manu Bay surf and views as far as the eye can see. Directly across the road is Ngaruanui Track, approximately a 20 min walk each way to beach - a must do walk with breath taking scenery along the way. Property is NOT SUITABLE for children under 10yrs due to deck railing, please do not submit an enquiry if you have children 10yrs and under. You have complete ownership of home however there is a 1 bedroom apartment downstairs which is currently let to our caretaker. This has no impact on your stay as you are not sharing any outdoor entertaining areas. Please note; zero tolerance with regards to PARTY guests. If you breach this policy you will be asked to leave straight away. * Minimum of 5 night booking over xmas/new year period. PLEASE NOTE THIS IS NOT A PARTY HOUSE! Linen (optional, NZ$18.00 per person). Hi, I am property manager for this property, if you have any special requests please do not hesitate to contact me as we pride ourselves on "going the extra mile". Heatpump installed in main living area with smaller convectional heater in master bedroom. Parking space on driveway for 2 vehicles. Coffee, tea, sugar, salt and pepper provided. Smart TV and Freeview Channels. Top deck has table and chair seating, accommodating 6 guests. Patio area has outdoor furniture. Raglan Golf Club, Te Hutewai Rd, Raglan. Exquisite views from this property. Stunning Views. Very clean. Well equipped. We had a fabulous 3 nights at this property as a family of 5. We could have sat on the balcony and watched the surfers all day! Easy to self cater as the kitchen had all the basics. And efficient communication with Julls. We would definitely come back. Earles Lookout is located overlooking the middle Raglan surfbreak, which is a 5 minute drive down the hill. Town is a 15 minute drive, and you can take a 15 minute hike down a forest path to the beach below. The house is spotless, and the location and view can't be beat, especially if you are a surfer. The photos don’t do justice of the stunning views, over-looking beaches and coast line to the north and west. The house is in a nice quiet location. Would definitely recommend, and will come back. Fabulous views overlooking Manu Bay from this property.